Haven’t picked the right outfit for your wedding day yet? A wedding generally is a formal event that calls for a standard dress and colour code for the groom. It is important for you as the groom-to-be to finalise the correct wedding outfit that will make your presence noticeable. Wedding outfits for the groom can be classy, contemporary or a mix of both. Luckily for you, Briggins can help you create some of the most stylish wedding ensembles of the season. While planning wedding outfits for yourself as the groom, as well as your groomsmen, you have to strike a perfect balance between overshadowing and underwhelming. Be it a cocktail affair or a sunny beach wedding, it is essential to go according to the theme and get a wedding outfit that also suits the weather. At Briggins, you receive personalised recommendations based on your requirements. The groom suits are one-of-a-kind, and the options can spoil you for choice. The colour wheel: The colour wheel is an important part of any suit and tie combination. You can expect to be informed about the complimentary, contrasting and similar colour tones, as Briggins helps you pair together shades that would look phenomenal. Shirt and Tie rules:Wedding outfits for the groom call for a traditional pattern like solids or simplistic While selecting the tie, textured patterns work well with most attires. You will also be encouraged to try out traditional coloured suits like black, grey or navy to match the shirt and tie. Popular as one of the most convenient themes for a wedding, black tie events require a straightforward attire: a black suit and a black tie. The wedding outfit also includes a solid colour dress shirt, black leather belt and leather dress shoes. If you add the finesse of cufflinks or waistcoats to it, you can stand out in the crowd for all the right reasons. Although it is not a popular wedding theme, white tie outfits make unique groom suits, especially if you are having a traditional wedding. The ensemble includes a black tailcoat, black trousers, white bow tie, waistcoat and black leather shoes. Cocktail themes add a dash of comfort to a wedding. It explored the more adventurous side of fashion, combining a light coloured suit with a solid or patterned shirt, a tie and leather dress shoes. You also have the option to choose from tropical attires and smart casuals. 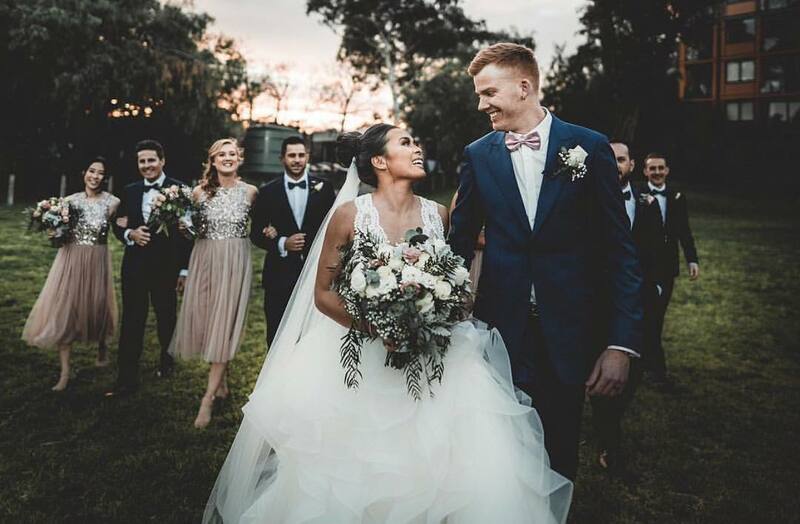 To enquire about wedding outfits for the groom or even your guests you can visit the store or contact Briggins at 03 8821 4168. Trust Briggins to make every occasion noteworthy as the experienced tailors cater to your needs in every possible way. Follow our article about 4 Tips for Choosing the Perfect Wedding Suit. This entry was posted in Blog and tagged Wedding Day, Wedding Outfits, Wedding Outfits for Men.